March 27 – April 4. 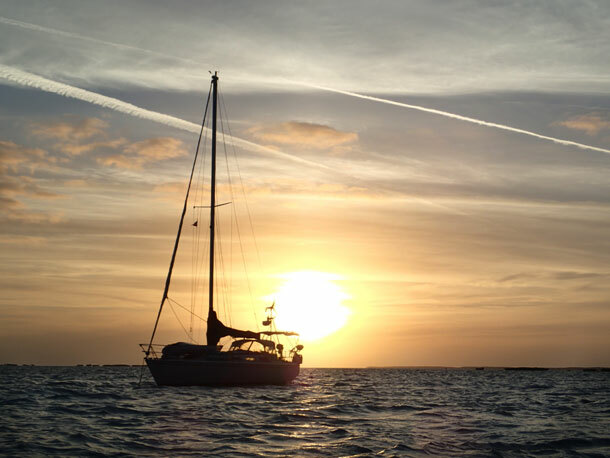 The sun sets on Blue Wing and the south side of Great Exuma. I love being in the middle of nowhere. No boats in sight, no people, no signs of civilization, no voices on the VHF radio. Only the sound of the wind rushing through the rigging, the gentle rocking of the boat, and the sun shining on creamy turquoise blue water. This is living the life. Once we arrived in Thompson Bay we scrapped our plans to head further south to the Aklins and Crooked Islands. We need to be back in the states (yes, I know, it sounds sooo continental, doesnâ€™t it?) at the beginning of May and the distance was too far in the wrong direction to allow us enough time to make our return goal. There were also westerlies on the horizon and our anchorages would be so limited, that we werenâ€™t sure it would be worth the trouble. My quest to see pink flamingos in the wild will have to wait for another voyage. We had hoped to do laundry while at Long Island, but this plan fell flat also. Long Island Breeze, the hotel, restaurant and yacht club where the laundry is located was running low on water. Of the three water delivery trucks on the island, none of them were running. No water, no laundry. Still our trip to Thompson Bay was not a total bust. 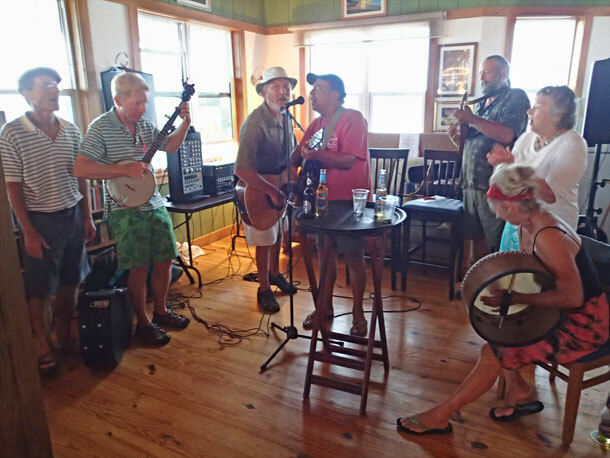 Friday night was a music jam at Long Island Breeze and Greg got to play a few tunes. We ran into a few cruisers we had met during this yearâ€™s and last yearâ€™s travels. We hiked up to the next town to a nice community center thrift sale and although we didnâ€™t find anything we needed, we had the chance to see a game of little league baseball at the ball field behind the center. We enjoyed a drink with proprietress of the Old Thompson Bay Club, Tryphena, who schooled us in at the art of polishing shells. We spent some time at our favorite watering hole, Souâ€™ Side. Met some more cruisers and joined a happy hour on the beach. After all that socializing and civilization it was soon time to move on to somewhere new. Really new. 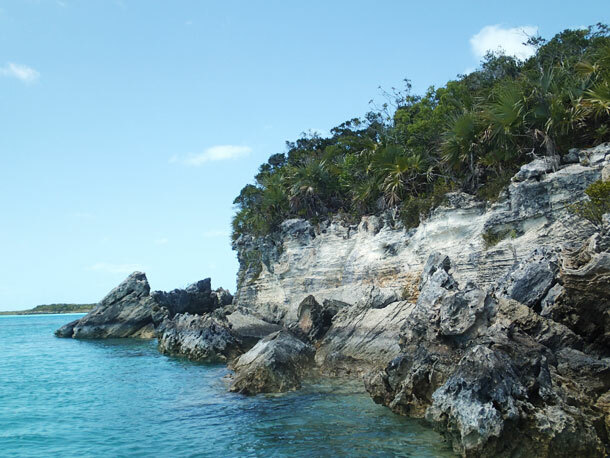 We decided to sail back up to Black Point on the route less traveled, on the banks, south side of Great Exuma. This route is a longer trek back north, but you donâ€™t have to go through George Town (Yay!) 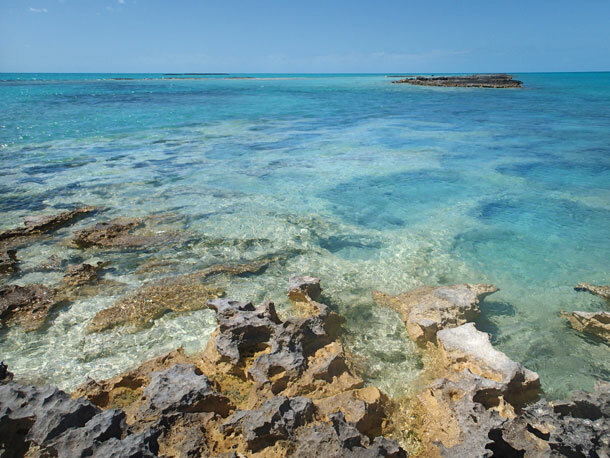 or go into Exuma Sound (this means no inlets â€“ Yay! Yay!). There arenâ€™t many anchorages along this path (especially for our draft) and the distances between them are long. There are no towns and none of the small cays along the way are inhabited. In general, Cruisers donâ€™t take this route and since part of this cruising ground is a no take marine reserve we wonâ€™t even see any fishermen. The first leg of our trip is about 40 miles and we will need to transit the Comer Channel to get to the banks. We get up early Monday morning and make great time. 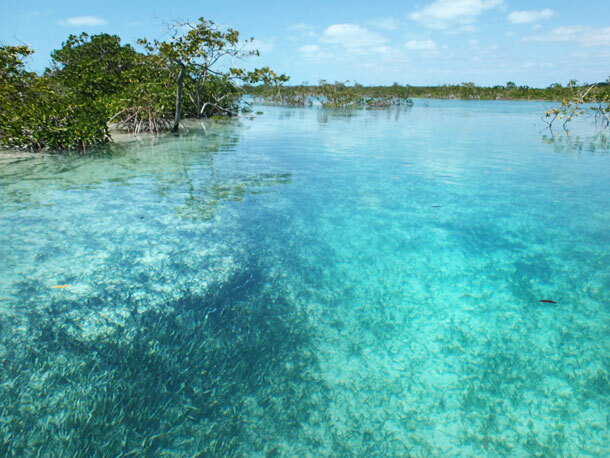 We arrive at the anchorage west of the Channel Cays near the southern border of the Jewfish Cays marine reserve. We donâ€™t see any other boats along the way. From the anchorage we can see water towers for the settlements on the south side of Great Exuma. On the VHF, occasionally we hear a call for Elvis, the water taxi in Georgetown 7 miles away on the other side of the big island, but these are our only signs of life back on the grid. 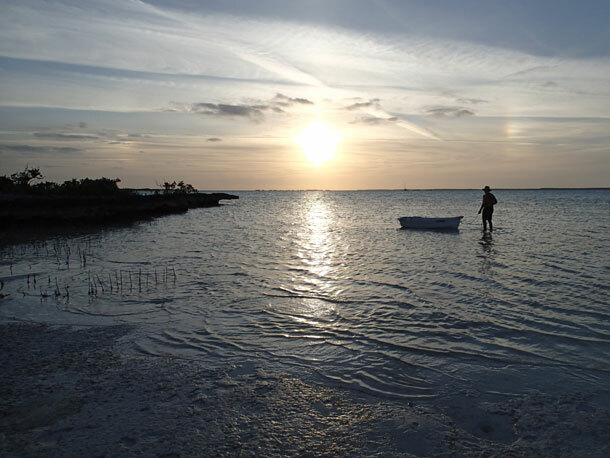 Low tide is fast approaching and to the west of the largest of the Channel Cays is a shallow mangrove swamp that dries with the ebbing water, so we head out to explore before it gets dark. The next day we explore to the north. We are rowing Fever again after a month and a half with our inflatable dink, Jethrine and our outboard motor. It is a mile and a half to the nearest of the Jewfish Cays, Green Turtle, and luckily we are rowing with the current that cuts through the islands. This made the trip a little easier against a strong wind. North of Green Turtle we find a waterway into a mangrove swamp. 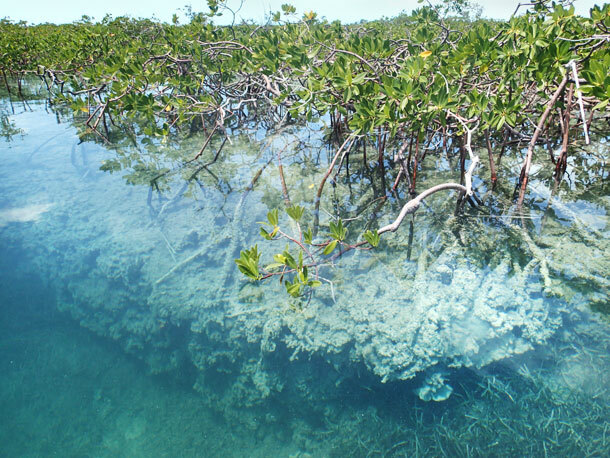 The water here is clear and we can see reefs and fish as we glide between the tangles of branches, roots and leaves. We search for a path through to the other side of the island, but keep hitting dead ends. Finally we turn back. As we round the corner out of the swamp a 6-foot shark whips around Fever and into the mangrove from the direction we just came. On our way back to Blue Wing we row across the southern end of the island. Large boulders in the water line the entire bottom rim of the cay. One note about our anchorage â€“ The breeze was robust and although our spot was wonderful when the wind and current were moving in the same direction, it got a little rocky when they opposed. Wednesday we make the short hop up to Coakley Cay where we planned to explore and spend the night, but the wind was still strong and the anchorage was uncomfortable. We continued to sail on up to Rocky Point. We still hadnâ€™t seen another boat and at Rocky Point the signs of civilization were even less than they had been at the Jewfish Cays. No voices on the VHF. Great Exuma was just a dark sliver on the horizon. We spend Thursday exploring to of the islands at Rocky Point. 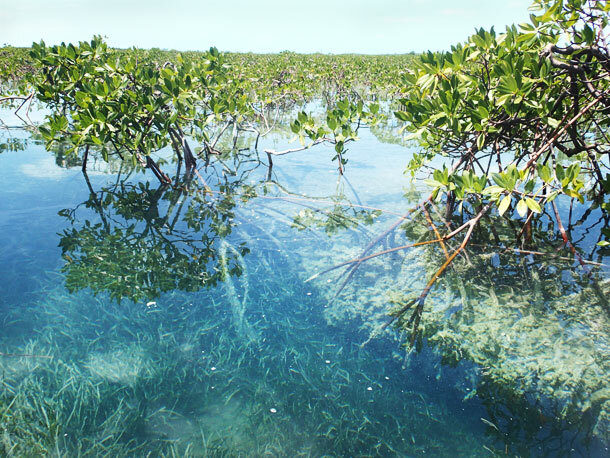 Around every corner was an amazing vista of mangroves, rocky shorelines and dazzling blue water. Friday morning it was time to head back to civilization. The laundry situation was getting pretty serious. With just about 40 miles to Black Point we thought we could make it in time for Scorpioâ€™s happy hour. We got an early start, but the wind had finally decided to settle down and we limped along averaging about 3 knots. We didnâ€™t see any signs of civilization until afternoon, when Greg spotted the BeTelCo tower at Little Farmers Cay about 7 miles out (about 16 miles from Black Point). 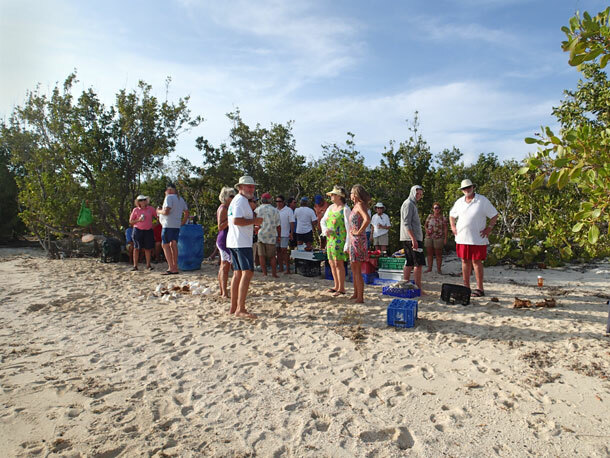 Soon after that we heard we heard voices on the VHF and boats off the coast of Great Guana Cay. Around 6pm (too late for Happy Hour, boo hoo), we dropped sail and rounded the point into the packed harbor at Black Point. We had some dinner, watch some â€˜sodes on the computer, and went to bed to the sounds of civilization and the music of Friday night in Black Point. Still – living the life. Jammin’ at Long Island Breeze. Left to right: Jim and Bentley from Salty Paws, Greg, Ted Wiliams from Mekhaya, Mark from Rachel, Sarah from Skeeter, and I can’t remember the drummer’s name. Happy hour on the north beach of Thompson Bay. The official reason for this gathering is Sarah (from Skeeter’s) birthday. Unofficially, it’s Sunday and all the businesses that serve drinks are closed. Here on the Sou’ Side we have anchored in the channel by one of the Channel Cays. We dinked in before sunset. It’s low tide and you could almost walk the mile between here and the next big islet. View from north side of Channel Cay. 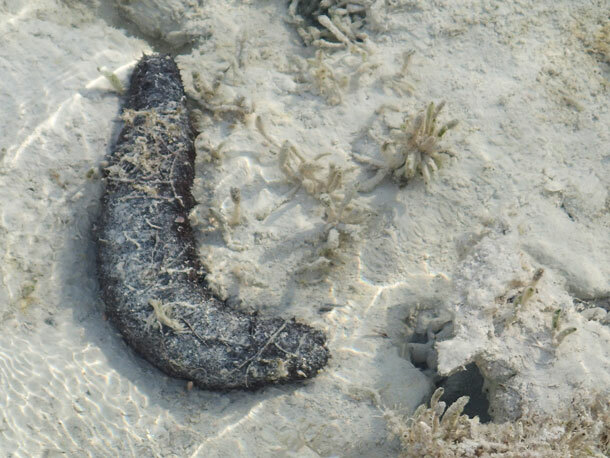 Eight inch sea slug at Channel Cay. We thought walking in the shallows would be easier than crossing the rocky shoreline. But had to keep from stepping on the slugs. 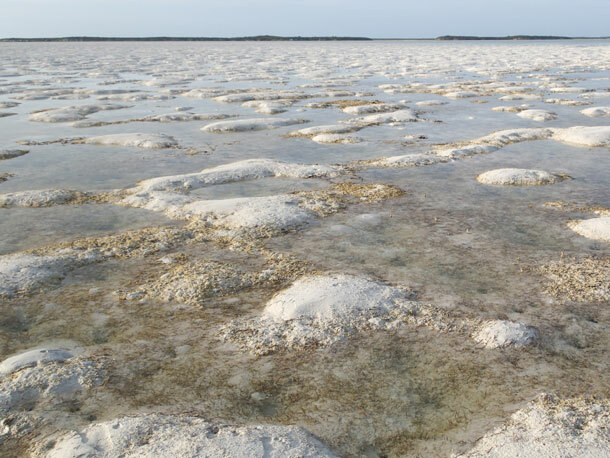 Low tide terrain at Channel Cay. 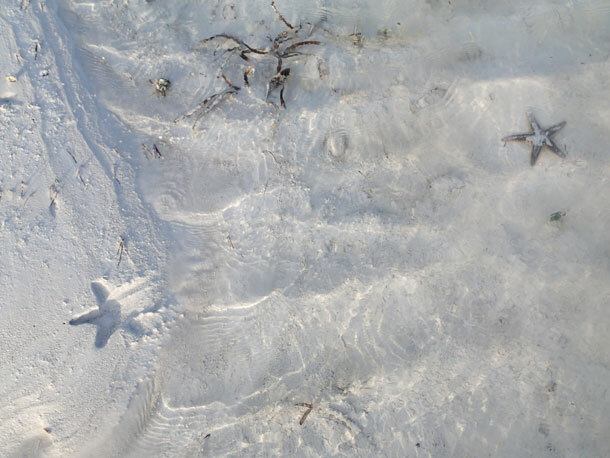 Here at Channel Cay a starfish has moved from its mid-tide position (left) to its low-tide spot (right). There were a lot of these small starfish here. Getting ready to row back. 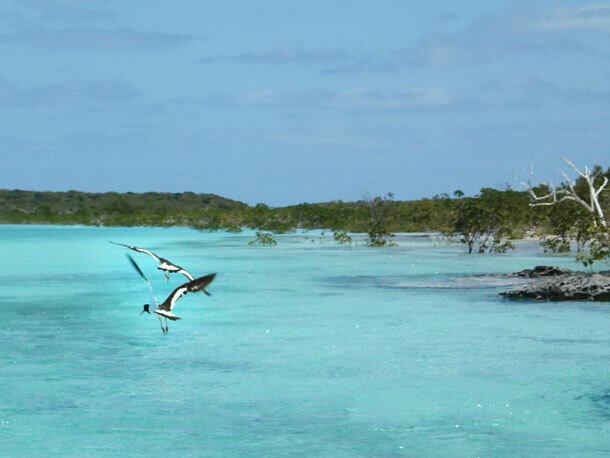 A pair of Oystercatchers flies away as we approach Green Turtle Cay. 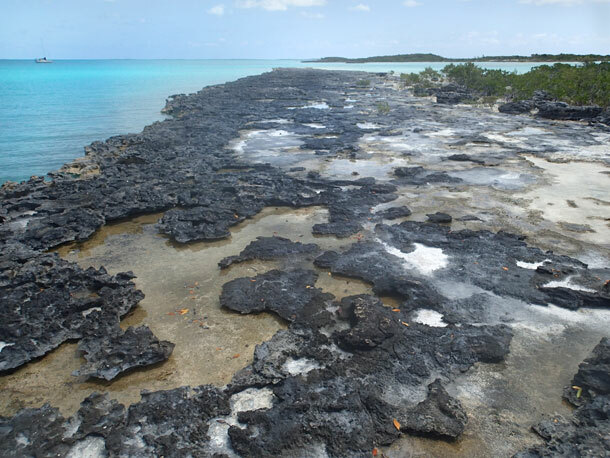 We found this amazing deep channel on the north side of Green Turtle Cay. We followed it into a mangrove swamp, hoping it would take us all around the north side of the cay. We kept on running into dead ends, though. At first the water was so clear you could easily see the sides and bottom of the channel. 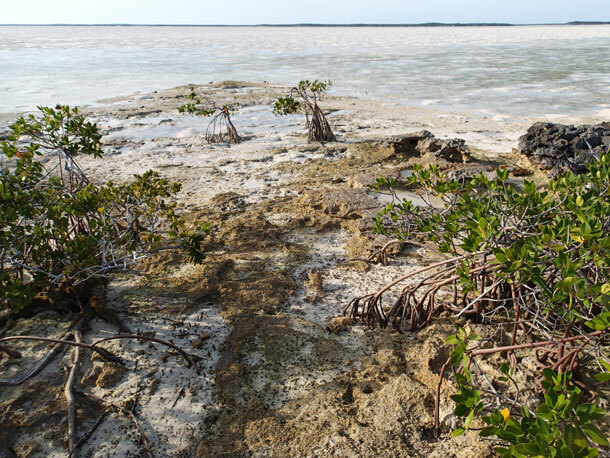 Mangroves at Green Turtle Cay. You can see their roots through the clear water. 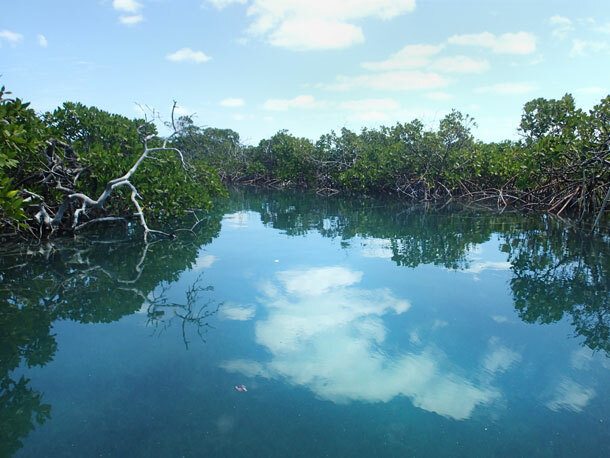 Clouds reflected on the water in the mangrove swamp at Green Turtle. 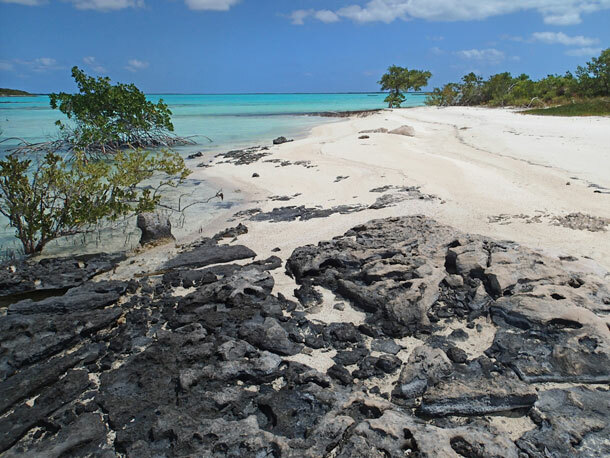 Coastline of the south side of Green Turtle Cay. From the look of the rocks in the water it appears that they were all shed from the coast about the same time. Maybe during a hurricane? Fragmented southern coast of Green Turtle Cay. 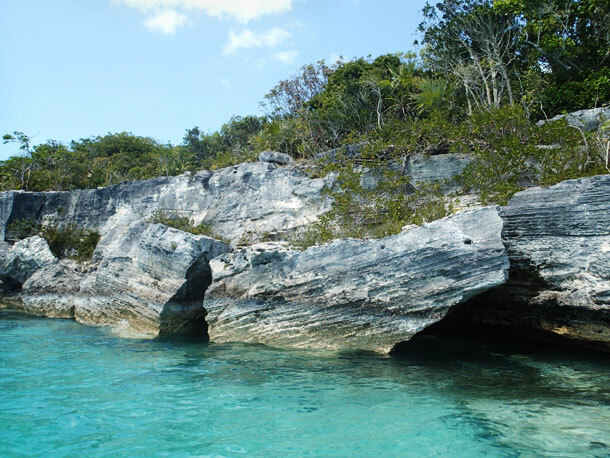 View of beach at the biggest of the Rocky Point Cays. It’s about a half mile long. We walked along the rocky northern shore and over a couple of beaches that had no footprints or even litter on them. To get to the south shore we had to slog through a shallow mangrove swamp. 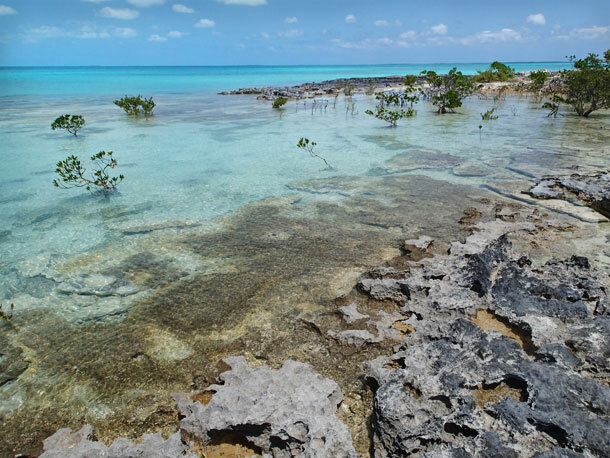 View from the smallest Rocky Point cay looking out toward the rocks that project into the Exuma Bank. 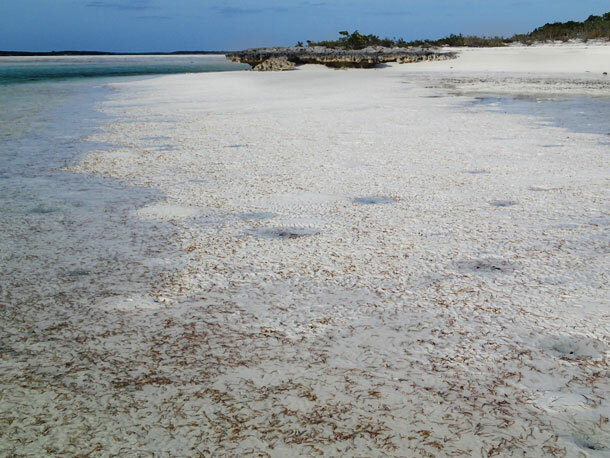 From north shore of smallest Rocky Point cay. Blue Wing sits in the top left hand corner of the picture. It’s quiet here. We haven’t seen another boat in three days. Will be pleased to see you back. love the pics, that beach at Thompson Bay sure was buggy at sunset. There’s a cool well there just down the wooded path. I’m in Rock Sound today, bound for Hatchet Bay.